The Good, the Bad, and the Seriously Tasty | Barranquilla or Bust! Limonada Natural. These tart, frozen lemonade drinks are on almost every menu. There are high-end and low-end versions, with the former being this all-natural, elegant granita concoction and the latter basically a mouth-puckering Slurpee. But they are ALL delicious! Mmmmmm! Colombians’ penchant for sour gummy candy. The “sour sweets” thing is apparently very popular; sour gummy candy is everywhere, and in all forms! Witness the Sour Mini Burger and Sour Gecko: Also, gummy candy is advertised in sort of the same way as chocolate. You have your run-of-the-mill versions, but then you have your gourmet “Imported from Europe” varieties like these: As a long-time connoisseur of Sour Patch Kids and related items, I can vouch for these supposedly European gummy worms. Really, they were remarkably good. Salsa music and all my favorite Spanish-language pop music (Juanes! Shakira!) playing everywhere – cabs, stores, the street (some corners have loud speakers). Everywhere! Blackberry juice and juice drinks. The coastal region where we live is known for its fresh juice. You can get passion fruit, guava, watermelon, papaya, and a zillion other juices on the street, in nice restaurants, and in people’s homes — all locations where blenders seem to be in use everyday, all the time. The best part of this for me is the blackberry (“mora”) juice. I love blackberries, but I never even thought of juicing them. 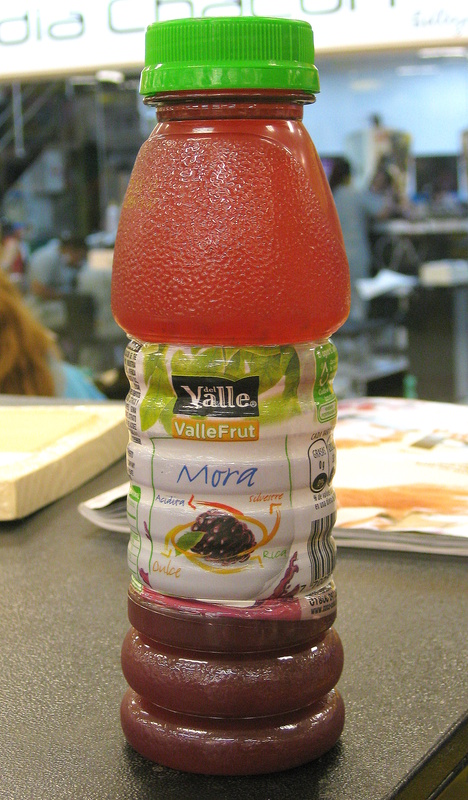 As with the limonadas and the gummies, you can get the low-end Minute Maid Mora drink (here, “del Valle,” Coca-Cola’s Latin Minute Maid equivalent) at any convenience store, or you can get the real deal at the street stand or a restaurant. I love both. Domicilios, or home deliveries/in-home services. In Barranquilla, you can get almost anything delivered to your house, and the same is true for lots of services. You can even have a washing machine delivered to you for your use over a 24 hour period. If the domicilio involves purchase of a product, it’s almost always free. Salvator’s Pizza. Better pizza than you can get in Miami, not that I think Miami is a great pizza town (although it beats my other beloved U.S. city, Seattle), with some of the most unique flavor combinations I’ve ever seen. Spicy food. I love spicy food. I miss it with a longing that borders on the romantic, especially if it is full of exotic flavors. Sadly, spicy food is almost nowhere to be found here, except in Mexican restaurants (thank you, thank you, for Mexican restaurants). The food does not even come with black pepper. My homesickness for spice is exacerbated by the fact that my cherished, gorgeous, highly functional pepper grinder was among the items ruined when our shipment from the U.S. was left out in the rain. I did, however, buy something akin to Tabasco — Piquetasco! — in the grocery store, which made me feel a little better. Big, entree-style salads. You know, like the ones you would get at — dare I say it — the Cheesecake Factory. Or in my case, the ones I would make at home for myself and my husband, with various kinds of lettuce piled with a zillion other raw veggies and topped with grilled chicken, nuts, etc. I’ve tried making them at home here in B’quilla, but for some reason I cannot get the lettuce to stay crisp in the fridge. I am somewhat comforted by the fact that crispy slaw is possible. And I can always go to Crepes and Waffles and get a salad fix. Or maybe a side salad next to that crepe. Light bulbs – the kind that aren’t energy efficient or good for the environment. I know, I know. I should have been using the energy-saving twisty bulbs when I lived in the U.S. I always felt guilty that I didn’t. (Unfortunately, I am someone who would be tempted to stockpile GE “Reveal” and “Soft White” bulbs.) In Colombia, I haven’t seen “regular” light bulbs anywhere, except for those little tear-shaped bulbs for a chandelier, and so energy efficient, environmentally friendly I am… grudgingly. I’m sure both lists will grow as the months pass. But in the meantime, where are my gummy worms?! This entry was posted in Food & Coffee and tagged adventure, barranquilla, Colombia, expat, food, gummy candy, international, Latin America, south america, travel. Bookmark the permalink. So I was thinking. With all this new learned information you could start a business right out of your home office to help other people relocate. Just package it! You have a point… although I know I still have so much to learn! You doing great Courtenay!!! have you tried Jugo de Guayaba or Zapayo…yummmy!! Girl, you are making me wish I was there for all the food & candy!! Make sure to get jugo de maracuyá. It’s so good, I had to write a whole post about how much I loved it: lavidacolombiana. To refresh the crispness of your lettuce, simply cut a thin wafer from the bottom of the stalk where it was harvested and soak in cold water for 30 minutes. This can be done several times with the same head while you eat away on it.